This morning I was up at 4.15am…the sky was dark. I drove by the light of the waning moon. I was heading out to pick up our make-up artist for our early morning photo shoot for MOTIF Mag . I couldn’t believe how quickly the sky was growing lighter as I drove to our first location. I also couldn’t believe how consumed I was with picking up the coffees and pastries for our crew. Not only did I want make sure I was looking after our girls, but I also couldn’t wait to get my lips around one of Mr Jean-Francois Perron’s almond croissants. I had had the pleasure before, on those not-so-occasional weekends when we would treat ourselves to one of Choco Cannelle’s particularly prodigious pastries. It is only down the road after all. I’m just lucky that I live so close to something so good. 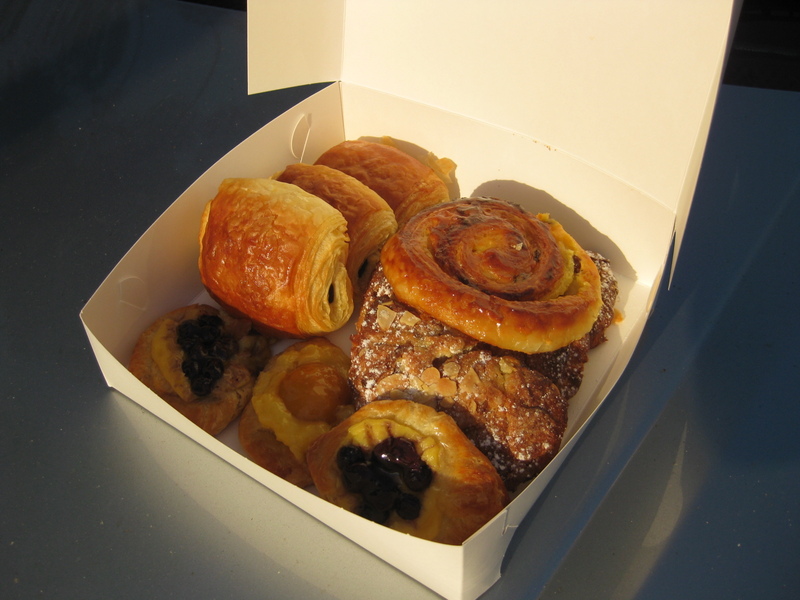 Here is the photo I took of the box of pastries (almond croissant, chocolate croissant, snail, fruit danish) as it almost slid off my car bonnet. I wanted to blog about this because I love good food but I also love great service and exemplary establishments. Jean-Francois was so obliging, letting me buy the pastries well before opening hours (complete with freshly applied jam glaze), and also for making me six coffees (which were excellent by the way), while still in the middle of his morning preperations.